Brill product, Brill price and very polite customer service, oh fast delivery as well! Quick and well packaged delivery. The battery was pre-charged, simple to install and had ample power. I've only been using it a couple of weeks, but so far it's proving a good recomendation from the site. Bike started first press after 12 months in the garage. 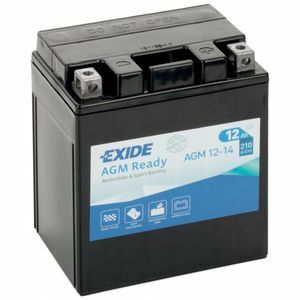 Best battery I have bought. Excellent service from Tayna arrived bang on time. Great battery at a great price, I needed a higher CCA and this battery fitted what I required and starts my old GPZ first time. This battery is far better than my previous 'wet' one which started to lose its charge after 2 years. Battery came within 3 days standard delivery with Yodel, well packed in good condition. Decided to go for maintenance free this time as normal lead acid ones only seems to last 18 months tops as not regularly run bike. Turned bike over several times without starting as bike had not run for 12 months, left bike for 2 days as thought I had flooded it same thing happened turned over not started left for another day and bike started up ran great once warmed up. Started several times since without any issues must look after my batteries better with trickle charger and run more regularly. Only 4 star because I've only had it for a few weeks.